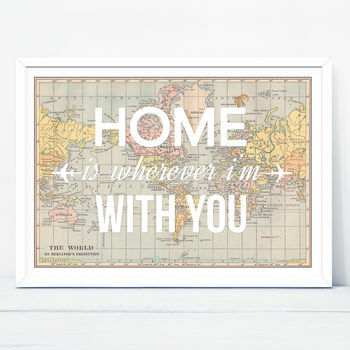 This stunning world map print features the loving quote 'Home is Wherever I'm With You' making it a charming persoanlised gift this Valentines day. 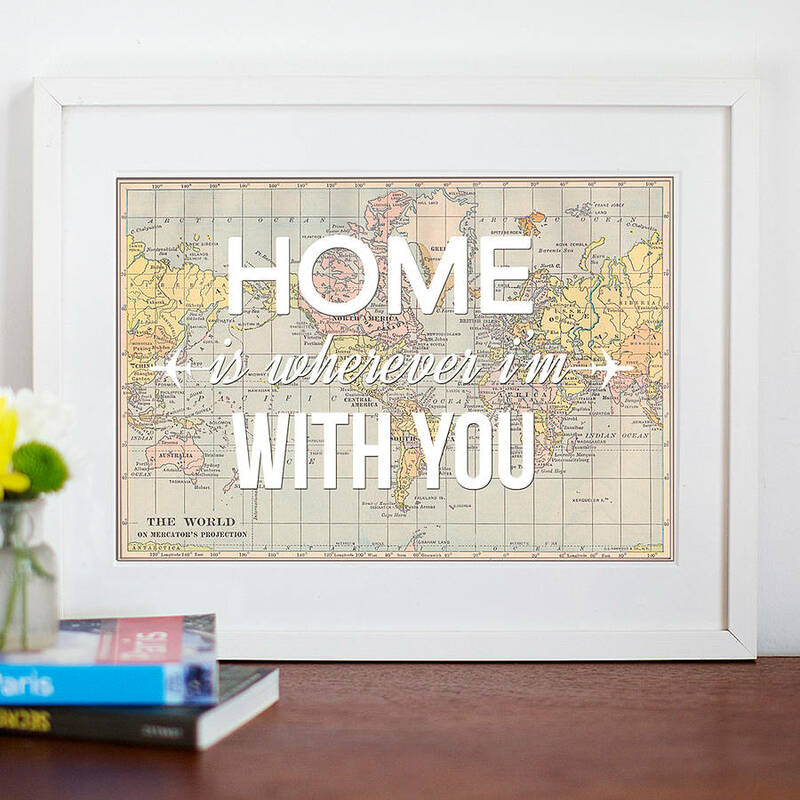 This beautiful world map print is formed from the combination of a stunning vintage world map and the quote 'Home is Wherever I'm With You'. 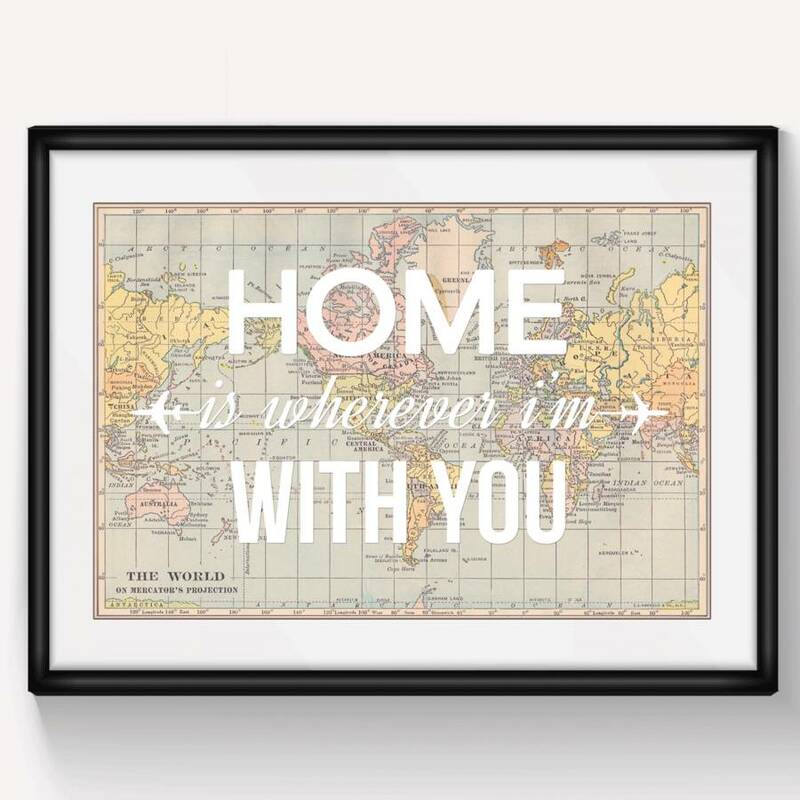 The stunning depiction of a vintage world map and its romantic sentiment ensures this print would make the perfect Valentines gift for your loved one. Alternatively it would make an ideal gift for an anniversary or birthday. 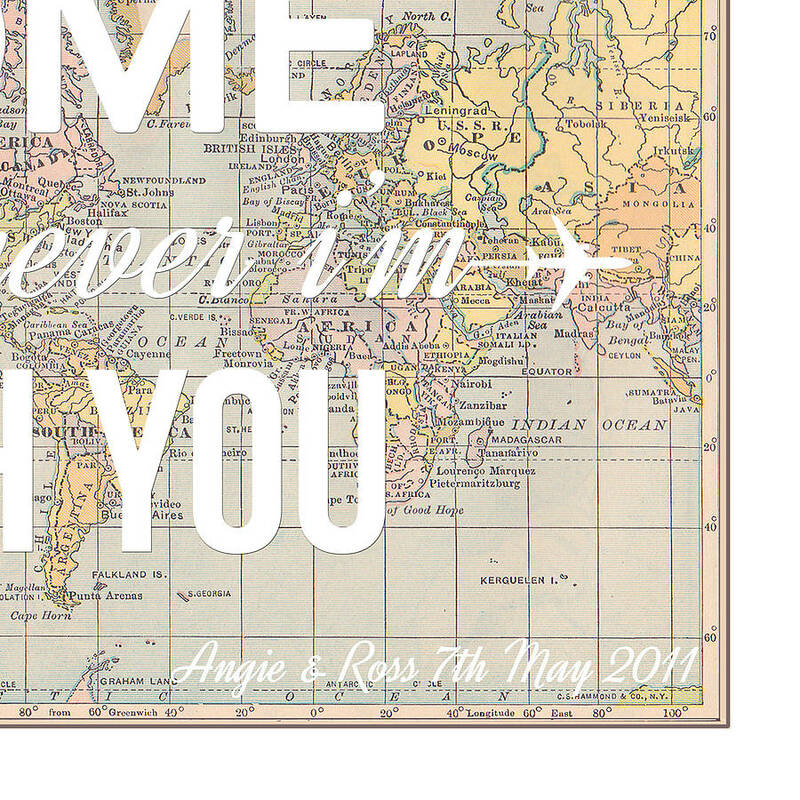 The map print can be personalised so why not add your wedding/engagement date for example? Or the date you moved into your forever home? 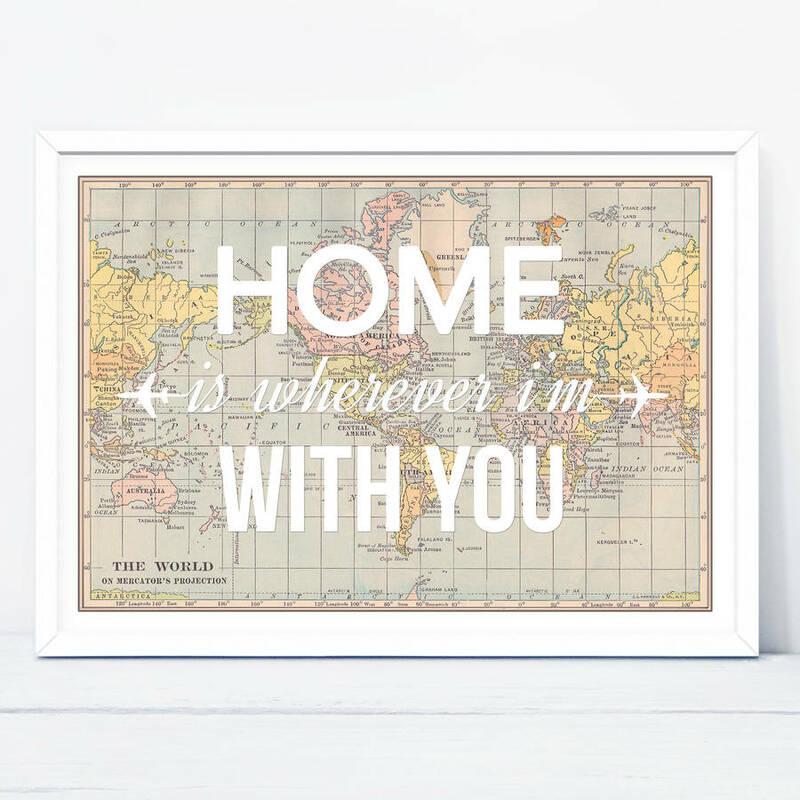 The 'Home is Wherever' print can be personalised with a message written in the bottom right hand corner, please see the photographs for a close up of how this could look. Simply add the custom type you would like in the section upon checkout. A3/A2/A1 Giclee prints - the larger size prints are printed on a premium 270gsm paper using top of the range HP printers. The specialist paper has a matt-coating with an off-white shade and a smooth surface texture. The matt coating guarantees brilliant colours and a sharp resolution. 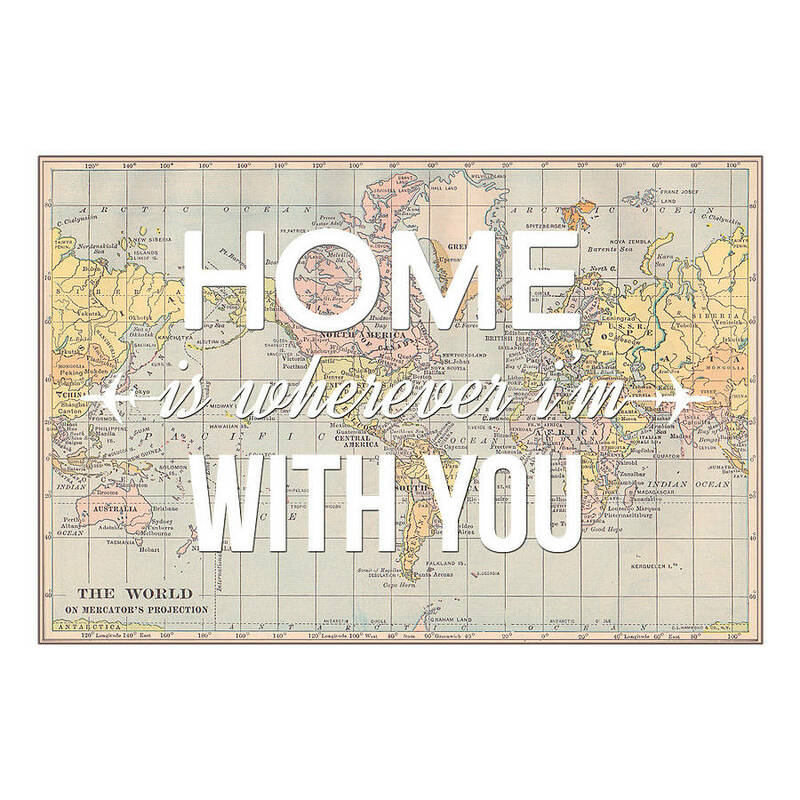 The 'Home is Wherever' map print can be framed and mounted in your choice of black or white frame. The real wood frames have a smooth finish with no grain visible and come with high quality acrylic safety glazing. The frames provide the perfect finish and come complete with a precision cut mount and D rings with cord for displaying. The frames are supplied and prepared by specialist framers and members of the Fine Art Trade Guild. Unfortunately EXPRESS DELIVERY DOES NOT APPLY TO FRAMED ITEMS and they are only available for UK delivery.